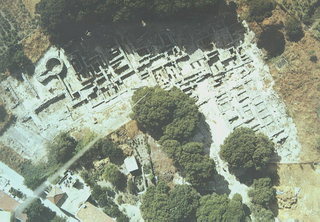 The houses of Tylissos were built during the LM I period (16th-15th century B.C.). Additions were made on House A in the LM II (15th-14th century B.C.) and on House C during the LM III period (14th century B.C.). The site was destroyed by fire in the 14th century B.C. and reinhabited in historic times as is attested by ruins of later houses over the Minoan ones. Tylissos was excavated by Joseph Chatzidakis in 1902-1913. In 1954, in the course of restorations, parts of a paved court were revealed to the west, and a small stoa with five columns to the north of the Square of the Altar.